We know Sandye Johnson Smith is in this picture because she lent it to us. She's the fourth person on the third row. Fifth is Nancy Nicholson and sixth is Janet Crapps Toole. Second from left on the third row is Ladatha "Dottie" Pate. 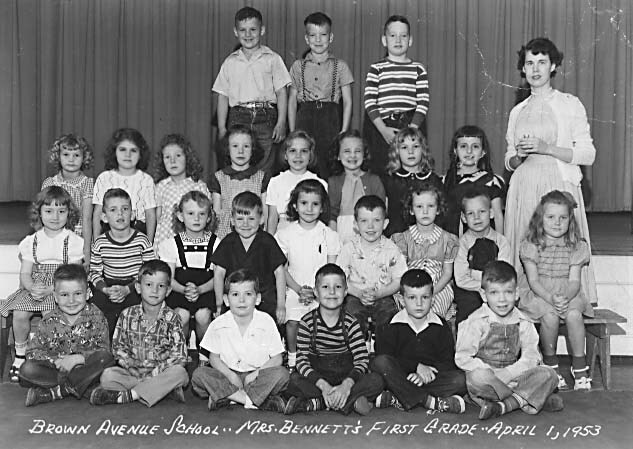 On the second row, the first person is Linda Faye Johnson Boswell. Seventh from left is Shelba Davenport (Burwell) Who else from the Class of '64 can you find here? If you can identify these people, send a note to . Class of '64 Graduates on Monday evening, June 1. The Thirty-Second Reunion of the Class of '64 was held Friday and Saturday evenings, October 11 and 12. Friday was a mixer at the Longhorn, and Saturday was a dinner with a surprise birthday party for Oscar P. Boyles, who was 73 on October 14.